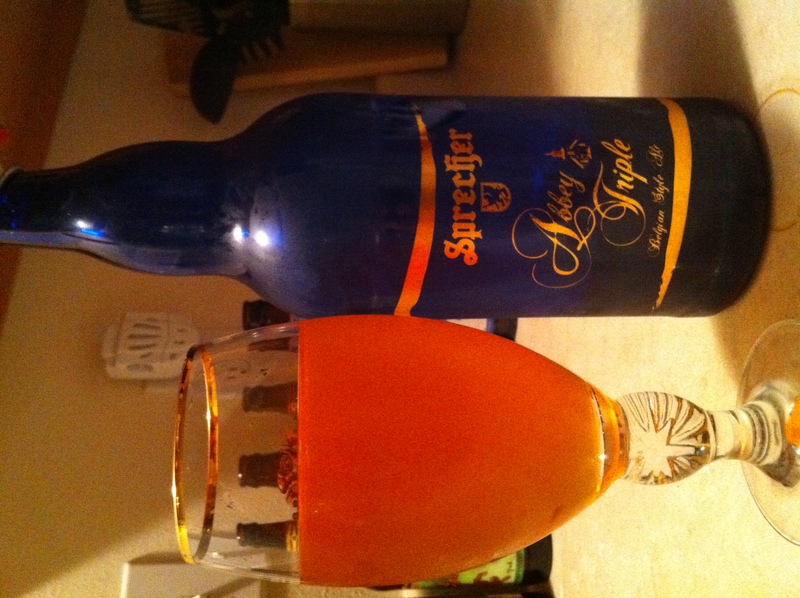 We bought a bottle of Sprecher Abbey Triple (bottle 1062) at John’s Grocery a few weeks ago, and we finally decided to open it tonight. After cutting through the plastic coated pop-top, we were immediately greeted with a very strong and distinctive aroma. There was the traditional Belgian style smells, however this particular beer also carried some extra sour, as well as almost creamy or buttery / butterscotch hints. The first sips definitely speak of Belgian ale, unfortunately that distinctive aroma (which I will not simply refer to as butter) isn’t as apparent with the taste. This 20 week aged 8.41% alcohol by volume beer does throw a little punch, however like most Belgians it’s barely apparent over the reasonably strong carbonation. 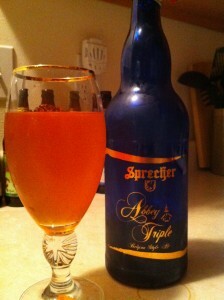 Sour flavors cover the palette as I swallow this beer, even more so than I’m typically used to in a Belgian. Overall, delicious. It’s sold in 1/2 and 1/4 bbls as well… I can’t even imagine. -initial thought of standard blue moon, immediate extra citrus smell and flavor. -8.2% alcohol is not apparent in taste and flavor. 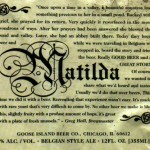 I opened my last bottle of Goose Island Matilda today. This bottle is a previous edition (2008 – bottled 07-07-08) compared to the new 2010 labels for the Goose Island “Premium” series. The Matilda is a decent 7% alcohol by volume Belgian style ale that definitely has a different taste than most traditional (yes I know, poor descriptor) beligan style ale. The Matilda is a bit more tart and less yeast flavored than other ales I’ve had recently, although the armoa coming from the glass definitely speaks to the belgian style. It will be fun to try to 2010 version and see how it evolves… maybe with a Sofie or Pere Jaques by my side? This 10.2% alcohol by volume beer is larger addition to the bells lineup. 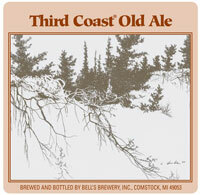 At about $15 per 6-pack, I hoped it would be an interesting addition to the Third Coast Ale. At firts I didn’t know it was a Barleywine, it’s a bit sweeter than I was expecting, and has a nice aroma. Comparison to the Third Coast Ale isn’t a good idea other than by name, this one isn’t as hoppy and is best consumed much slower. Unfortunately, we went through all 6 bottles within a month! Overall, it was one of my favotire barleywines, however since I don’t have too much experience in the category (I usually don’t like barleywine beers) my opinion isn’t the most valuable.